Demakes, where somebody creates a mockup of a recent game that makes it look like it was built for some old, crappier system than what we have now, have been a Cool Thing To Do lately, and now there’s an app for that. 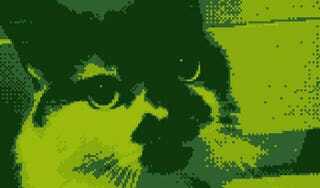 Retrospecs, a recent iOS photo app, will take your pictures and make them look like they were rendered on computer hardware that’s older than your mom, and our cousin Leon at Kotaku UK tested it out on some game screenshots, and also his cat. The fun thing about the app, Leon notes, is that it has filters for stuff you probably have never heard of, which is how you know it’s good aside from the more obvious ways you know it’s good, like from using it. The reason this is cool is because those old systems had pretty distinct display styles that weren’t dictated by developers, unlike today. So even if you don’t buy these as true demakes, you mean person you, perhaps you can simply enjoy the strange novelty of the filters. In any case, here’s what UK Cousin Leon came up with. I also briefly dabbled in demakes this week, if you want to take a look at mine.